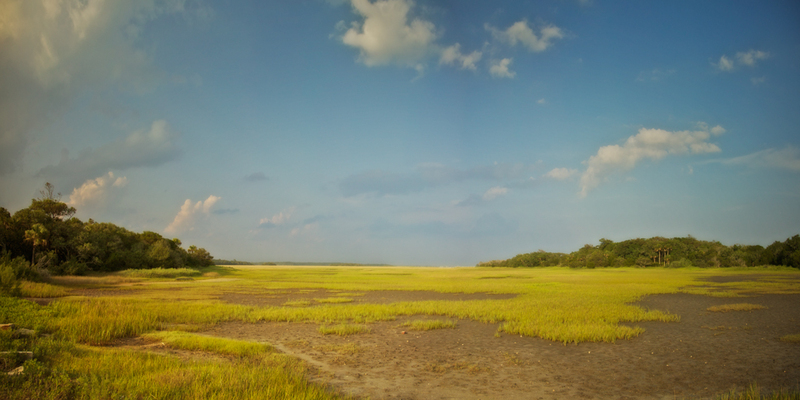 People call it the lowcountry, or low country, and it’s made up of the coastal lands south of Charleston, South Carolina, including Beaufort, Colleton, Hampton and Jasper counties. Some include Charleston, some don’t. Some include Myrtle Beach. But all seem to agree that it’s as much a state of mind as a geographic area. I just spent a week in the lowcountry, in a house on Edisto Beach, where I’m assured by the travel literature that I’ve had the real island living experience. Lowcountry refers to the fact that much of the land is at sea level. In short, much of the time you’re in a swamp, or to put it euphemistically, a coastal wetland. There’s beauty in the lowlands. A subtle beauty perhaps – wild, earthy and damp. Shooting photos along side Store Creek, I found myself growing increasingly creeped out when I remembered that I was less than a hundred yards away from a tourist attraction called the Serpentarium. The point was drilled home a day or two later when I noticed a freshly squashed rattlesnake on the highway. Oak Tree on Store Creek Next to Edisto Island Serpentarium, Edisto Island, Charleston County, South Carolina. The first evening there we were treated to a dramatic thunderstorm, complete with torrential rains. The dunes lay between my screened-in porch and the beach, spanned by a boardwalk. Usually this is to protect the dunes. But these dunes aren’t covered with dune grass. Instead you have your own private swamp between you and the beach, and after the storm, the frogs started. Eventually I had to call someone to let them hear the chorus, which eventually got so loud we literally had to go inside to escape the sound. The next night, and all subsequent nights they were gone. I’m not a beach person. I prefer my beaches strewn with stones and boulders rather than sand. But I can adapt to warm water. Don’t get me wrong, Edisto Beach is certainly a nice place to spend a week or two. But at times it feels more like a plantation lifestyle, rather than a Jimmy Buffet song. 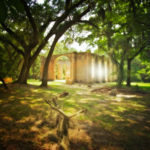 There are former plantations a plenty on Edisto Island, but most are in private hands, and the only view you’ll likely get is of an avenue of oaks behind wrought iron gates. Edisto island was settled during the early days of our country, first by the Spanish, then by the English. Commerce thrived with the production of sea island cotton, considered the king of all cottons, and untold wealth poured into the area up to the Civil War. Or the War Between the States, the Confederate War, or whatever your politics lead you to call it. This wealth was made possible with slave labor, and there’s no getting around that. By most reports, slavery in the low country was less abhorrent than in other places, not only because of a system which gave the slave more free time to live their life, but perhaps a bit more respect as well. But there were atrocities too. And the low country is certainly haunted. There are enough legends and stories to keep a ghost-hunter busy for some time. The war slowed commerce, and the boll weevil finished the cotton trade. Farming now consists of vegetables, fruits and tourists. Edisto Beach is certainly one of the less touristy spots a person could visit. There are only a few gift shops in town, a scattering of restaurants and most refreshingly, very few tourist traps. There is also only one grocery store in town, and one liquor store. If you come for a visit, it’s best to come prepared, or be prepared to pay. You come onto the island down SC 174, and there’s no getting away from the fact that you’re in the deep south. Alongside the highway you find farm stands – fruit, boiled peanuts, sweet corn and a variety of sea creatures ready to boil. There are also churches dotting the landscape, at times less than a mile apart. There’s no escaping the poverty. Many of the houses lining the highway are little more than shacks, with blacks sitting on the porches, trying to avoid the heat. One out of five residents on Edisto island under the age of 18 are below the poverty line, and over one in three over the age of 65. The median household income for the island is just under 26,000. But once you hit Edisto Beach, it jumps to $54,400. The percentage of blacks, which is at 40% on the whole island, drops to below 3% in Edisto Beach. In short, as someone told me down there, they just haven’t gotten the hang of desegregation. Instead of working the plantations, now blacks work the Piggly Wiggly. The lowcountry gullah culture of the African-Americans has preserved more of their African heritage than anyplace else in the United States. In fact, it’s one of the biggest tourist attractions to the area. Unfortunately, there seems to be less interest in the individual as there is in the culture. In the 140 page South Carolina Low Country Tourist Guide, there are no black families enjoying the beach and sites. Only living history demonstrators and performers. But hey! It’s the old south, and if this kind of thing bothers you, you’re in the wrong place. As Lynyrd Skynyrd pointed out to Neil Young, who took Alabama to task for the treatment of blacks in Alabama, “southern man don’t need him around, anyhow.” The politics are nuanced and well beyond me, and besides, I was on vacation. Sitting at home now, a few days later, scratching my chigger and mosquito bites, as well as poison ivy and other assorted bites and rashes, I find myself missing the place. But I just can’t put my finger on why. On Edisto Beach, bottle-nosed dolphins swim just off -shore, sometimes in twos and threes. The sunsets are majestic, the light dancing over the wetlands magical. And gnarled oaks hung heavily with Spanish moss is about as magical as you can get. There’s history for those who look for it, but once again, it’s a subtle history. An abandoned plantation here, a ruined church there. A minor battle or skirmish from the revolution or War Between the States. Subtle enough that you get a feeling of discovery when you come across them, and all draped in that magical moss. Then there’s Beaufort. Instantly recognizable for anyone who saw Forrest Gump, it’s an example of the southern tendency to remember and live with its past. 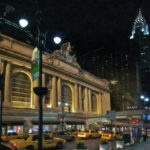 If you were to suddenly materialize in New York City, Chicago, London – any number of increasingly faceless cities – you’d have a hard time knowing where you were. But find yourself in Beaufort, or it’s larger sister, Charleston, and you’ll instantly know you’re in the south. The architecture stuns the senses with grandeur and intricate details. Civic buildings, shops and houses aren’t pulled down as frequently for new projects. Instead, new businesses go into old structures. 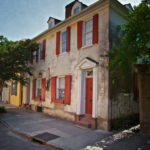 In places, whole towns seems like one interconnected historical attraction. It’s not living history, the people there are surrounded by history every day. And then there’s the landscape. The wetlands, the oaks dripping with Spanish moss, as well as the baking heat, all come together to give the area a sense of identity. One that can’t be altered by architectural styles, history or politics. Maybe that’s the key to island living. Life and change moves slowly, and some things never change. Like a pile of shrimp at the end of the day, rum drinks with fruit juices and the sun sinking into the sea, wondering where the time goes. 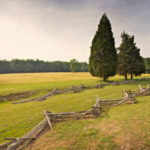 Yorktown Battlefield Historic Site: Vive la Yorktown! Your photographs of the South Carolina Lowcountry, and particularly of Edisto Island, are breathtakingly beautiful. May I link to you on my blog: Charleston through a Artist’s Eye? Your pictures are paintings; so full of your heart. I enjoy your missives on the places photographed as much as the pictures. Slipping in a few statistics peppers up the lovely descriptions. I was on the fence regarding a trip next month to Charleston. You’ve pushed me into the lowland sulky swamps for it! I live in paradise(Edisto Island) full time and have yet to feel bad about anything, its peaceful, serene, great people, we’re just a bif family helping each other here…i have found the place i want to die in. My name is Jane and I’m with Dwellable. I was looking for blogs about Edisto Beach to share on our site and I came across your post…If you’re open to it, shoot me an email at jane(at)dwellable(dot)com. Find more curiosities by clicking here. Want curiosities in your inbox? 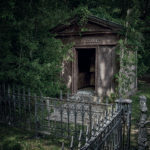 Sign up to receive new content from A Gothic Curiosity Cabinet. 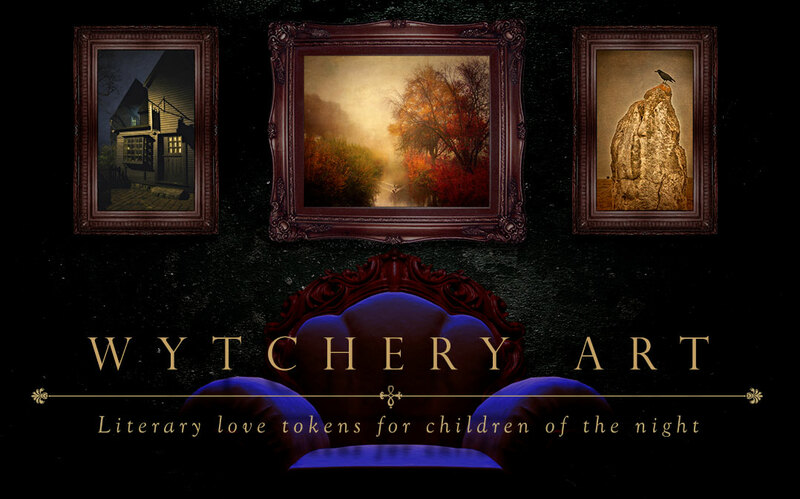 Each email also contains a coupon for discounts on fine art prints from The Wytchery.